Considering the wind as an extra source of power, the fuel use of cargo ships can be reduced substantially. Steam power and diesel engines relegated cargo sailing ships to the history books, since motorized ships are a lot faster, cheaper and more reliable. But now that the fuel use of ships and the ecological damage involved passes all bounds, there is a renewed interest in wind power as an extra source of energy; thanks to an extreme water sport. Sailing at the touch of a button: wind-powered, computer-controlled. Kiteboating: the sailing ship reinvented. Sailrockets: the fastest sailing boats. Wind is a free source of energy, but a cargo sailing ship needed a huge crew to operate the rigging. In addition, wind is unpredictable – it was impossible to know beforehand when a sailing ship would reach its destination. Modern sailing ships can benefit from technology that didn’t exist one and a half centuries ago. Since the mid-nineties, the Danish shipbuilder Knud E Hansen is working on a 200-meter long cargo ship in which the diesel engine is assisted by a set of 6 high-tech sails. They are made from fibreglass and take the shape of a wing, which makes them twice as efficient as the canvas sails on a traditional vessel. The rigging is operated from the bridge by remote control, so there is hardly any need for extra crew. The Swedish-Norwegian shipbuilder Wallenius Wilhelmsen presented a similar concept in 2005. In this case, the sails are also covered with solar panels. However, both concepts did not go beyond a few scale models. One of the main disadvantages is that a sailing ship, no matter how modern its sails, lists heavily in high winds. A trait that is not desirable on today’s mammoth ships, where containers are stacked up by the dozens. Another disadvantage is that the sails cause extra resistance when the ship is propelled by the diesel engine alone. In other words, if there is no wind, the rigging makes for extra fuel use. Furthermore, the masts and sails also hinder the loading and unloading of cargo, and they can raise problems when passing under a bridge. 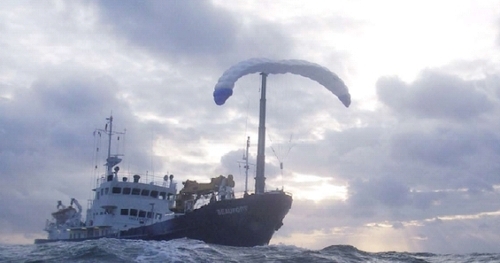 Furthermore, the ship is not listing in heavy winds and the kite does not hinder the loading and unloading process. The kite is launched and pulled in automatically, both processes take around 20 minutes. Another advantage is that the system can be installed on an existing cargo vessel. SkySails started carrying out tests with prototypes in 2004. Now, the technology is getting commercialized. At first sight, it seems impossible that a relative small kite can propel a cargo ship. The explanation for that is the altitude at which the kite flies. A few hundred meters above the ocean surface, the wind is much more powerful and steady than at the height of a traditional sail. At an altitude of 200 metres, twice as much wind can be harvested with the same sail surface - which translates into traction that is four times higher, since the wind pressure is equal to the square of the wind speed. 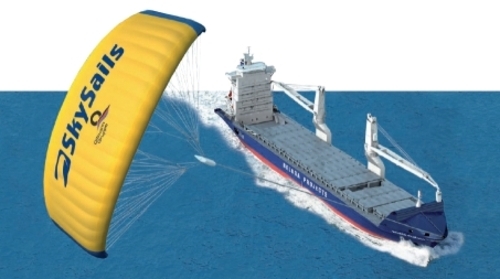 The company is sure that a kite can bring down the fuel costs from ships with 10 to 50 percent. The exact amount depends on the route and the season. However, the new sailing ships are not by definition a good thing for the environment. The extra energy that is supplied by wind power can also be converted into extra speed, by running the diesel motor on full power while the wind blows (SkySails also recommends that option). The only way around that is to equip ships with other renewable energy sources (like solar panels or wave energy) and to get rid of the diesel engine completely – like in the case of this Australian passenger ship. There is also a lot of ecological profit to be gained by replacing the extremely dirty marine fuel by the cleaner diesel that is used by road transport. 1. According to the International Maritime Organization (IMO) the amount of carbon dioxide emitted by cargo ships is twice that from air travel. 3. A wave powered boat : cool, but why not use wind power? 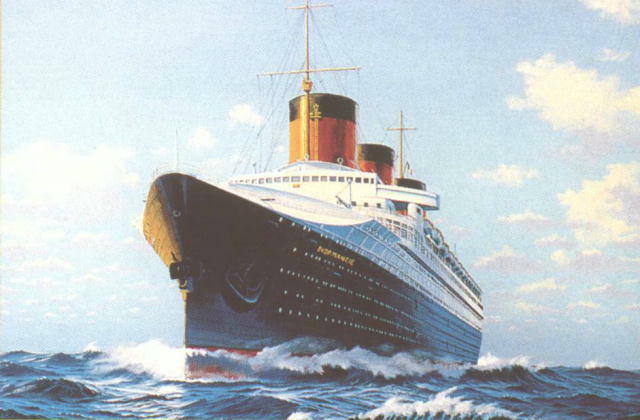 Life without airplanes : can ocean liners save long distance travel and tourism? Planes on wheels : is a high speed train more eco-friendly than an aeroplane? Floating windmills : energy from the clouds? Green, slow air cargo : airships could become the most eco-friendly mode of transport. Lego for Big Boys : habitable shipping containers. Main page / Subscribe via email or feed / Follow us on Twitter or Facebook.